In this blog I will discuss How Implement of private one to one chat between database table users with SignalR? SignalR is used for real time communication in ASP.NET. I will create separate user control for chat application. Please check below How to I implement it. 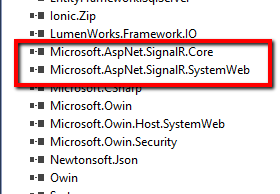 Step 1: Install SignalR from nuget to application. Give reference of css & js file of Jquery Chat Box Plugin. It will start working. Step 4: Add notify.mp3 in directory which will play on message alert. Step 5: Add chatboxManager.js file in project. Add following code in user control. That's it run project & Start Chat. You can download the source code of the application from github. Thanks, that's what I am looking for. Implementation of this code will be available soon. is it possible to communicate you? I would send you the issue I am facing. Implementation of this is available now. How can get list user when user offline? How do I send a message to an offline user in a SignalR chat program? Please hepl me! Have you find out how to send and receive messages to Offline users? can anyone tell me that what is "GetCurrentUserName()" in ctlChatBox.ascx.cs ?? Looking for an MVC version of this project? MVC version is not available but you can integrate it easily. I will add MVC version of this project soon.